Its product lines like this that help me regain faith in drug-store products. Maybelline Fit Me has the potential to be a high end product. All three products round up to create a flawless everyday look. The foundation offers a natural look and buildable coverage. The concealer hides blemishes and puts away those dark circles. Its easy application makes applying everyday make up fairly quick. The pressed powder is wonderful for mattifying foundation to hide shine and I must say that the puff that comes with it is my new favourite puff. The foundation is in liquid form with an SPF of 18. The colour that I wear is 315 which is Soft Honey. 30ml of product will last a while. My prediction will be 3-6 months depending on how often you wear make-up and the coverage you wish to achieve. The packaging is beautiful and looks professional. This product can be applied using fingers, a brush or a sponge. My personal preference is to use the beauty blender as I feel I achieve a high coverage with not as much product. There is only one negative: if you are trying to avoid parabens, then do not use this product. It has methylparaben, propylparaben, ethylparaben, isobutylparaben and butylparaben. I do regret to inform you that the packaging is not filled with concealer that there is less than you think inside. However the 6.8ml (or maybe less) will be enough to cover up what you need along with the 30ml of foundation. The shade I wear is 35. It is perfect for my skin tone. 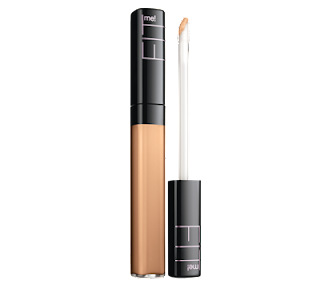 I can say that that this concealer is very close to the concealer offered by Luminess Air. The pressed powder is amazing. I must say that I see no need for touching up, so I don’t carry it with me. It offers a matt finish for the whole day. Keep in mind I have only used this product in the winter. In the summer, touch ups may be necessary. I must say, as I mentioned above that the puff is what makes this product. You see, a lot of people think that the quality depends on the product, but not the applicator, but you must remember that they are both just as important as each other. I use shade 315 Soft Honey. This product blends really well; it lets the skin breath and gives a natural and smooth finish. Overall, the collection has a wonderful finish and can be worn every day and semi-formal occasions.